Freeware cookig children game by Free-Game-Spot. Freeware cookig children Game by Free-Game-Spot.com. Yummy Pizza with a fishy twist! Learn how to chop your way through ingredients and serve up a steaming hot traditional pizza with a fun, fishy twist. Enjoy! Free online racing game with shooting elements by Free-Game-Spot. New freeware motorbike Game by Free-Game-Spot.com. Devilish Motorbike is a fun motorcycle riding Game that requires some key skill to help this scary devilish looking dude ride his motor bike through some challenging race courses filled with obstacles! Use arrow keys to drive motorcycle. Space bar to drive. 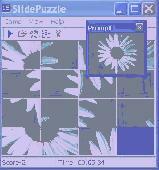 15 Slide Puzzle is an advanced version of the well-known fifteen puzzle game. The goal is to reposition the squares from a given arbitrary starting arrangement by sliding them into the empty spot with the least moves and time. Defeat your opponent by driving his pieces away in one of the earliest board games in recorded history. Emerged from the Roman Empire, Nine Men's Morris is an indulging game for two players. The board consists of an inner square, a middle square and an outer square, with 8 spots evenly distributed on each of the squares, making a total of 24 spots. Each of the two players are given 9 pieces, with one player taking the set in white color and the other taking the set in black. The pieces can be placed onto the spots on the board and move among the spots. The game is a 1-player platformer in which the player controls Cool Spot, who can jump, and attack by firing soda bubbles, which could be shot in all directions and while jumping. In each level the player must rescue other cool spots, who look exactly alike, from cages at the end of that level, which is not necessarily the point at the far right of the level map. Blind Spot is a puzzle Game developed by Novel Games, which helps improving players’ short term memory by displaying different geometric shapes on screen and then clearing them off, so that afterwards the player tries to point to their exact location to win points. A free interactive desktop pet based on the "7up Cool Spot" game. A free interactive desktop pet based on the "7up Cool Spot" Game. My third release for you to enjoy.